Nestled at the foot of the Great Smokies and the Blue Ridge Mountains in North Carolina, Winston-Salem is home to Wake Forest University. The school’s motto, Pro Humanitate, is often translated as “we do what we do for the sake of humanity.” Launched in early 2010 by Sandy Dickson and Mary Dalton, Wake Forest’s Documentary Film Program takes this motto to heart, with many of its instructors’ and students’ nonfiction films tending to focus on issues of social justice throughout the world. Teleconferencing from a converted cotton mill at the school’s Brookstown Campus—the Documentary Film Program’s headquarters—Program Director and Teaching Professor Cara Pilson and Creative Director and Professor of Practice Peter Gilbert (one of the directors of Hoop Dreams) recently spoke with Documentary magazine about Wake Forest’s dual Masters for Documentary Film Production. DOCUMENTARY: Can you give our readers some background as to the origins of Wake Forest’s Documentary Film Program? CARA PILSON: Well, the program’s origin can be traced back to The Documentary Institute at the University of Florida, which was founded by Sandy Dickson, Churchill Roberts, Cindy Hill and myself in 1998. That program offered an MA in Documentary Film and was actually named one of The Independent magazine’s “Top Ten Academic Documentary Programs.” When it became clear that the university was going to be shuttering that program, Sandy started exploring the idea of establishing a documentary program at Wake Forest in 2009, and in 2010 it was approved. Mary Dalton and Sandy were the original co-directors of the program. D: Wake Forest is somewhat unique since it offers both the MA in Sports Media & Storytelling and the MFA in Documentary Film. What do each of these programs have to offer? CP: Well, the MFA Program is a terminal degree, so students can teach at the university level; it’s not simply teaching [the students] how to speak about your films to industry professionals, but how you think about yourself as a creative person. There’s a focus on teaching people how to be filmmakers and also how to survive as filmmakers—whether in the industry or in the academy—giving them the skill sets they need to be creative storytellers on their own, to be able to work effectively in both of those areas. PETER GILBERT: Speaking as a working filmmaker, the programs actually replicate what I do for a living: I have to pitch, I have to write treatments, I have to write grant applications. Also, I have to know how to make films and tell a good story, so it is rather well-rounded. I’ve lived in New York and LA, and my home ground is Chicago, because that’s where Kartemquin is, but what’s nice is that down here, being in the South, it’s a different region of the country where there’s an amazing amount of stories to be told that are very pertinent to our politics today, and there’s this rich cultural heritage. So it’s nice to be in a place that has a different atmosphere than the big three. D: Wake Forest’s MA Program is somewhat unique with its concentration on sports media. Can you talk about that? PG: This may be a digression of sorts, but I come from a social justice background in filmmaking, and one of the reasons I love sports is the politics of it; it reflects so much on who our society is. And so with Hoop Dreams, for instance, a lot of people will say it’s a sports film, but to me it’s a film about family and inner-city life, one that is using sports as a way in. Nowadays in our media landscape you cannot go channel to channel without bumping into sports programs, but 30 years ago we had a hard time making that film because no one wanted to even look at a sports film. But now there’s all this different media content being created around sports, and so we bring people down to Wake—someone like Bob Lipsyte, who was a New York Times sports writer and a chronicler of Muhammad Ali. If you think about how politicized sports has become, how President Trump talks about athletes, and also the revenue stream of what sports means to American economics, sports becomes an integral way of looking at our society. D: Can you talk about Wake Forest’s reputation as being part of the "Ivy League of the South"? CP: We are open to students, to anyone who is passionate about telling stories, who feels that visual storytelling is really a way they can put their voice out to the world. 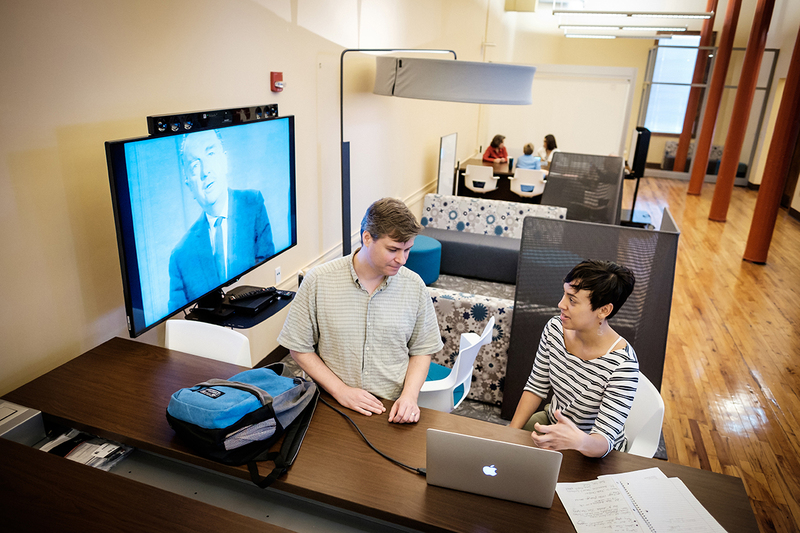 Our students have access to people who are doing a variety of research in a way that allows documentary students to come into their space and help tell their stories. PG: Wake is attractive to people who are into sports, but the school is really known for education; we have unique assets [and access] that you wouldn’t get in other schools with a similar-size program. We had one student who was an absolute sports nut, and that’s what he wanted to do—make highlight films—but he met up with his partner for his thesis film, Original Body of Pain, which is about the opioid crisis in Asheville, North Carolina. And what’s great is that he now has a job he really loves: working on Player’s Tribute in New York. One of the reasons he got that job was they don’t usually see people who come to them with a real personal-issue documentary, so they didn’t even talk to him about sports. The entire interview, which I actually sat in on, was all about character arc: Tell me what happened to that character in your film. He’s already producing pieces for them, and that’s why I don’t want to categorize us as just a sports program; it’s that social issue part that really adds something that will help you to get a job. D: The school has an in-house student production company. Logistically, how does that work? PG: It’s run like a normal production company, so that the students understand what that’s like out in the real world. They do work for the university and client-based work, in addition to working on their thesis films. CP: We had a lot of people knocking on our door, asking, 'Do you think your students would be interested in making this?' And we would say, 'Well, yes, but they’re also graduate students, and they have bills, so they should be able to make some money at doing this.' Also, we wanted to support their ability to do that, but we had to figure out how to do it in a way that didn’t take the equipment away from thesis films. So we actually had three MFA students who worked with Sandy Dickson, who is a professor in the program, and her husband, who was one of the deans in the business school, and they created a business plan to manage a student-run production house. That’s really how it started—built by students from the ground up. And now it’s housed under the graduate school, and the individual who works with it the closest is Chris Zaluski, who is a teaching professor within the program, but he’s also one of the MFA students who founded it, and he now runs it. PG: Chris started in journalism, and he actually won a Student Emmy. He went out into the world and freelanced and also ran the video side of Teach For America. We were lucky enough to have him come back. CP: Through his background—both before he came into the program and what he did for Teach For America—he’s been very much centered on multimedia storytelling. PG: One of the things we’re noticing—and I’m sure this is true of every program—is we’re getting people who are professionals in their field, who are coming back to school to learn filmmaking. We have one young guy who is an accomplished journalist and has a book coming out, but the media landscape is changing and he realized that documentary is really the future for what he does; he wants to be able to tell stories visually. D: I understand that an MFA student’s thesis film from Wake Forest was just picked up by POV, and will be shown on the upcoming season of America ReFramed. CP: Exit Music was ITVS-funded and it premiered at Hot Docs. We are thrilled for the director, Cameron Bargerstock Mulleanneaux. D: What type of support do the students receive from the school, from the instructors and from their own cohort? PG: It’s always been a relatively small program. Our class sizes range anywhere from eight to 14 students, and it’s a close-knit community. I have two emails right now from two former students who are asking for crew recommendations, so our students will always benefit from that very strong alumni network. 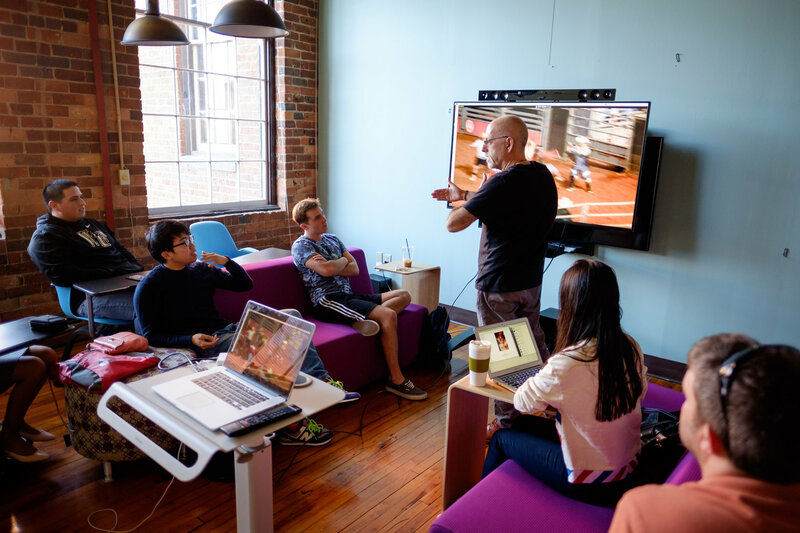 Wake is a great place for our students to be because of the access they have not only to equipment and facilities, but also to professors who recognize the value of visual storytelling, who have given them money from their research grants. And students have also been awarded the Richter Scholarship, which is a research travel grant that provides an opportunity for them to do international travel and to make films. As a result, our students have been to Guatemala, Indonesia, Nepal, Afghanistan, Puerto Rico. One student, Scott Schimmel, recently went to Vanuatu, and his film, My Garden, No Longer, just screened at Cannes’ Emerging Filmmaker Showcase. And that points to our emphasis on entrepreneurship. We provide some seed money for their films, but we also teach them grant writing and how to properly utilize crowdsource funding. Exit Music received funding from ITVS, but they also ran a very successful Kickstarter campaign. If you don’t teach it to them, more people actually fail at it than do well at it. D: As far as the entry process at Wake Forest, does it differ between the MA and the MFA program? CP: Not really. We do not require that students have had any previous film experience before, and this has always been the case. We are open to anyone who is passionate about telling stories, who wants to put work out there into the world that is, as Peter says, examining social justice issues, and feels that visual storytelling is a way that they can put their voice out into the world. We have had students come into our program from a biology background, or from a history background, or technology. Some students come straight out of undergraduate school, and we have a whole host of students who have come into our program 10 years out, 15 years out, so it is very much an open-door policy that allows us to create a very robust conversation about storytelling. We didn’t change that in any way with the MA Program in Sports. Again, we’re trying to get the most interesting group of people in the room who want to tell stories. D: So the MFA Program came first, and then the MA Program? CP: Yes, and I would say within their first year they are pretty much lock-step, but where the doc students might take a doc history course, the MA students would take sports culture and society, or sports marketing. But they take all the same writing courses, all the same production courses, all the same philosophy and ethics classes. D: When a student enters the program does she or he have to know ahead of time whether they want to go with the MA or the MFA, or do they have to decide within a certain time period? CP: Both. Some will come in knowing right away, but others have the ability to make their choice within that first year or even during the second semester. PG: One of the things we tried to do is to have a program that allows people to work while they’re getting their degrees, and have some flexibility. But at the same time they’re going to come out having a great education. Tom Gianakopoulos is a writer and editor who frequently contributes to Documentary. He currently teaches English at CBD College in Los Angeles, and Screenwriting at the New York Film Academy in Burbank.